Lewis Personal Training Boot Camps run on Tuesday + Thursday 6am + 7pm and Sunday 9am at the Obelisk Centre, Kingsthorpe, Northampton. All sessions take place outside on well-maintained grounds with changing rooms, toilets and showers available. At Lewis Personal Training Boot Camps are non-military as I believe that all exercises should be carried out using correct technique to avoid injury and gain results safely. Every session is planned differently to the last one and changes every month in terms of types of sessions. This enables clients to stay focused and motivated without getting bored, enjoying sessions more. I pride my sessions on being fun even when they are at their most challenging and that all clients are treated as individuals whatever their ability and goals. 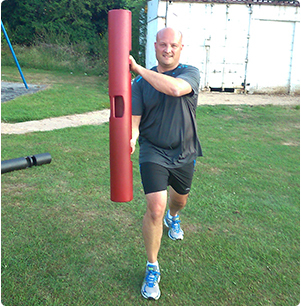 I specialise in outdoor fitness and functional training and sessions include Circuits, Bodyweight exercises, use of functional equipment such as Medballs, VIPr, Kettle Bells, Ropes, Tyres and Resistance Bands etc. Free membership to the Obelisk Centre is available through Boot Camp membership, so you can enjoy the benefits of the club and rental of the function room.